Gain Financial is a mortgage and credit advisor that seeks to find the best possible solution for financing requirements for anything from your property to your investment portfolio. Shayne Betreen is the Founder of Gain Financial and a mortgage and credit adviser with the company. As a Mortgage & Finance Association of Australia (MFAA) Approved Broker, Shayne has managed four other mortgage brokers in a franchise setting since 2010. For Gain Financial, client satisfaction is at the centre of every deal, and Shayne was eager to partner with service providers who shared the same values. Lawlab was the first conveyancer to really impress Shayne, who had struggled in the past to find a responsive, fast acting conveyancer. Property transaction communications are typically conducted over email with the broker, buyer's agent, real estate agent, conveyancer and banker cc'd on every email. According to Shayne, this meant that emails were often lost or forgotten about altogether. Aside from a team of property lawyers, lawlab also partners with a collaboration platform, Rundl. Rundl is an open business network for the communities that form around customer journeys, which makes it a great tool for brokers, lawyers, real estate agents, accountants and others professional service providers. In the past property transactions typically took place over a number of weeks, due in part to the lack of communication between service providers. Shayne lamented that it would sometimes take a week to hear from another professional, which held up the process and left Shayne and the client in the dark. Lawlab put a stop to this, keeping the lines of communication open 24/7. "We'd often have to chase up the other professionals in the transaction just to get an update on their progress, and we d worked with people who would take up to a week to get back to us. 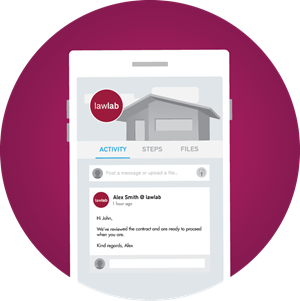 With lawlab, the flow of a transaction is so much smoother, and it saved us a huge amount of time. Speed is a huge benefit of both lawlab and Rundl." "Working with lawlab has been a really simple and professional experience, and with Rundl now in the mix, the decision to keep working with them as a partner is really easy."